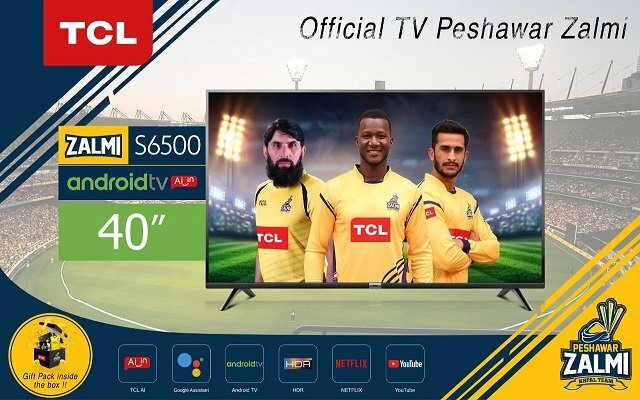 TCL, one of the world’s top three TV brands, has launched a special edition Zalmi TV to coincide with their sponsorship of Peshawar Zalmi for the upcoming 2019 season of HBL Pakistan Super League (PSL). The Zalmi TV released on the 20th of January 2018 is available in both 32 inch and 40 inch models for PKR 31,990 and PKR 42,990 respectively. Every new Zalmi TV comes in a special edition Peshawar Zalmi/TCL branded packaging which has a gift bag inside containing Zalmi-TCL branded merchandise. The Zalmi S6500 TV is a Smart TV featuring Licensed Android OS with built in AI through Google Assistant, comes loaded with Google Play Store and features a built in Chromecast. It also comes equipped with FHD display to provide an HDR visual function and Dolby audio technology for surround sound providing consumers an immersive viewing experience. Other than the Zalmi Gift Pack inside every TV, all customers who purchase the Zalmi TV will be entered into a Lucky Draw for which the prizes include 2 Winners to win a “Money Can’t Buy” trip to Dubai to watch a Peshawar Zalmi match and also meet and greet Zalmi players behind the scenes, Official Signed Zalmi Merchandise and Zalmi TVs as well. Further more, as a contribution towards the efforts to help the underprivileged, TCL and Peshawar Zalmi announced that a percentage of proceeds from each Zalmi S6500 TV sold will go towards the Zalmi Foundation which is leading the way in many charitable causes across Pakistan. As a leader in the TV industry, TCL has been providing customers in Pakistan with advanced, innovative technology at very affordable prices aimed at creating an immersive viewing experience in the comfort of their homes.